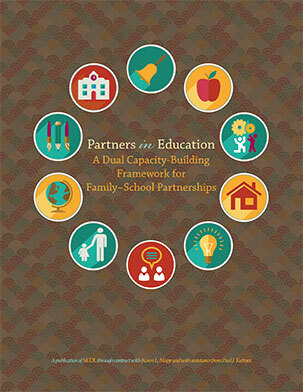 Partners in Education: A Dual Capacity-Building Framework for Family–School Partnerships is a publication of SEDL in collaboration with the U.S. Department of Education. It presents a new framework for designing family engagement initiatives that build capacity among educators and families to partner with one another around student success. Based in existing research and best practices, this report is designed to act as a scaffold for the development of family engagement strategies, policies, and programs. 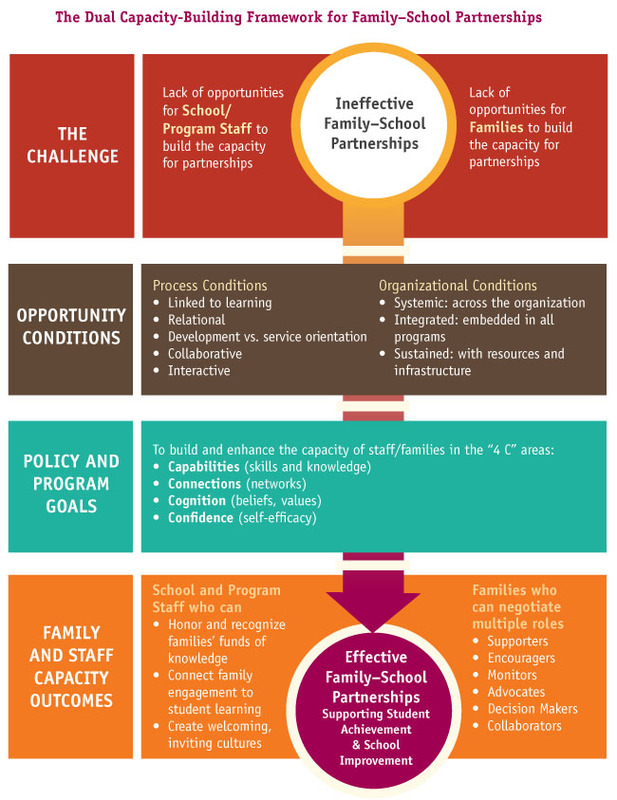 a description of the capacity-building outcomes for school and program staff as well as for families. Karen L. Mapp, EdD, is a Senior Lecturer on Education at the Harvard Graduate School of Education (HGSE) and the Faculty Director of the Education Policy and Management Master’s Program. Over the past twenty years, her research and practice focus has been on the cultivation of partnerships among families, community members and educators that support student achievement and school improvement. She has served as the co-coordinator with Professor Mark Warren of the Community Organizing and School Reform Research Project and as a core faculty member in the Doctorate in Educational Leadership (EDLD) program at HGSE. She is a founding member of the District Leaders Network on Family and Community Engagement, is a trustee of the Hyams Foundation in Boston, MA, and is on the board of the Institute for Educational Leadership (IEL) in Washington, DC. Dr. Mapp served as a consultant on family engagement to the United States Department of Education in the Office of Innovation and Improvement. Dr. Mapp joined HGSE in January of 2005 after serving for eighteen months as the Deputy Superintendent for Family and Community Engagement for the Boston Public Schools (BPS). While working with the BPS, she continued to fulfill her duties as president of the Institute for Responsive Education (IRE). She joined IRE in 1997 as Project Director, was appointed vice-president of IRE in May of 1998 and served as president from September 1998 to December 2004. Dr. Mapp holds an EdD and MA in Education from the Harvard Graduate School of Education, an MA in Education from Southern Connecticut State University, and a BA degree in Psychology from Trinity College in Hartford, CT.
Dr. Mapp is the author and co-author of several articles and books about the role of families and community members in the work of student achievement and school improvement including: A New Wave Of Evidence: The Impact of School, Family and Community Connections on Student Achievement (2002); “Having Their Say: Parents Describe How and Why They are Engaged in Their Children’s Learning” (2003); Beyond the Bake Sale: The Essential Guide to Family-School Partnerships (2010); “Debunking the Myth of the Hard to Reach Parent” (2010); “Title I and Parent Involvement: Lessons from the Past, Recommendations for the Future” (2011); and A Match on Dry Grass: Community Organizing as a Catalyst for School Reform (2011). Paul Kuttner is a researcher and educator whose work focuses on community-based approaches to school reform, youth civic engagement, and social change. He is a co-author of A Match on Dry Grass: Community Organizing as a Catalyst for School Reform (2011, Oxford University Press), and a co-editor of Disrupting the School-to-Prison Pipeline (2012, Harvard Educational Review). His current research focuses on the emerging field of youth cultural organizing, a youth development and social change strategy that engages young people as artists and change agents in their communities. Mr. Kuttner is currently finishing his doctoral studies at the Harvard Graduate School of Education and is a former co-chair of the Harvard Educational Review editorial board. Prior graduate school, He worked as a theater educator in Chicago, and co-founded the community-based organization Communities Creating Change. He holds an MA from the Harvard Graduate School of Education, and a BA from the University of Michigan, Ann Arbor. For more information about this report or to partner with SEDL on similar initiatives, please contact Lacy Wood at lacy.wood@sedl.org or call 512-391-6567.